Denver Broncos general manager John Elway stated his goal in last year’s draft was to get tougher, one thing that is certain they attempted to do, and could echo this season again. The Broncos signed Case Keenum at quarterback after a solid year in Minnesota, but a quarterback of the future is not out of the question after Keenum’s up-and-down career trajectory. If Denver does indeed draft a quarterback, it will be the fourth consecutive year in which they have done so, joining Paxton Lynch, Chad Kelly and Trevor Siemian on that list. 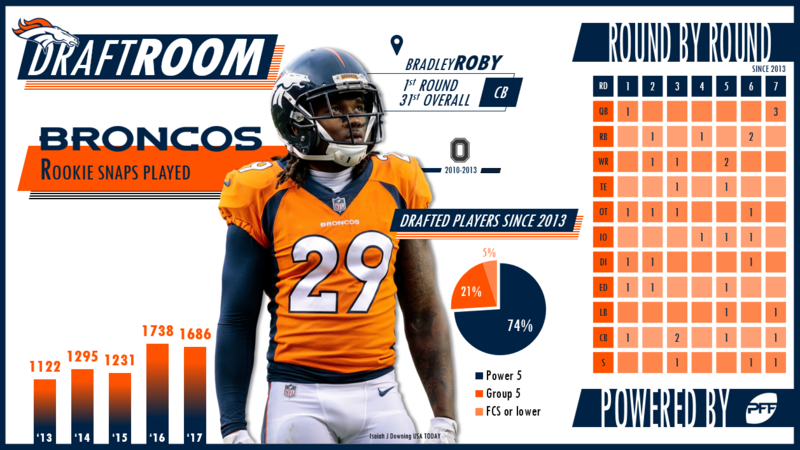 There is still a need along the offensive line for Denver, in addition to former first-round pick Garett Bolles as well as a hole in the secondary with Aqib Talib now in LA. They’ve added Su’a Cravens but don’t rule out taking additional help in the secondary, as we’ve learned covering receivers in today’s NFL (especially in the slot) is very valuable. Using our Wins Above Replacement (WAR – roughly the number of wins a team gets from replacing an off-the-street player with the player of interest) metric as a model, here’s how the Broncos’ draft classes stacked up league wide from 2013-2017. Earned a 90.4 PFF grade in 2016. The former first-round pick has been elevated from nickel corner to starter after three solid seasons in his first four. Earned 20 stops, two interceptions and three total pressures in his first season as a starter in 2017. Has been terrific as a run-blocker in his two seasons in Denver. The fullback graded well in 2016 with a 74.5 PFF grade. The former seventh-round pick out of Northwestern struggled in 2017 with a 53.2 PFF grade. The former first-round pick has struggled to earn a starting spot, generating a PFF grade below 50.0 in both seasons. Struggled with ball security as a returner, before eventually being benched mid-2017. Left for Atlanta after the 2016 season. Before then he struggled, earning PFF grades of 42.1 and 37.6. Earned just a 41.2 PFF grade during his third NFL season in 2017. Former general manager John Dorsey (who ran the last five draft in KC) is now with Cleveland and new general manager Brett Veach takes over for the Kansas City Chiefs. 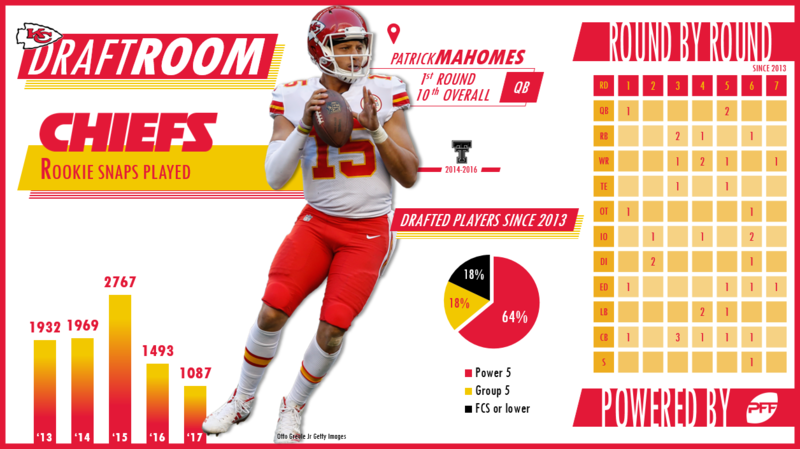 The Chiefs will be without a first-round selection after trading up last season for QB Patrick Mahomes and they’ve done a great job so far this offseason to build around their young signal-caller, bringing in WR Sammy Watkins to join WR Tyreek Hill and TE Travis Kelce as pass-catchers and RB Kareem Hunt in the backfield. In total, they’ve traded three of what would have been their first four picks in this year’s draft for offensive players, so defense could be on the forefront of the Chiefs front office heading into draft weekend. Defense would rightfully be a key addition as the team lacked seemingly all over, finishing last in PFF grades as a defensive unit. They brought in CB Kendall Fuller to man the slot in a trade for former QB Alex Smith but the holes don’t end there. Gone is Marcus Peters so a talented cornerback (or two) could be vital for Kansas City this draft. Using our Wins Above Replacement (WAR – roughly the number of wins a team gets from replacing an off-the-street player with the player of interest) metric as a model, here’s how the Chiefs’ draft classes stacked up league wide from 2013-2017. Led the NFL in rushing as a rookie, while adding another 415 and 16 missed tackles forced through the air. Was the league’s most-productive wide receiver on deep passes last season. Has led all NFL tight ends in yards after the catch three of the last four seasons, and came within five yards of doing so in 2015. Eight sacks, 13 hits and 60 hurries in two NFL seasons. Traded to the Rams in the offseason. Never allowed a passer rating over 70.0 into his coverage his first three seasons. Only 0.58 yards per route run after taking over as a starter in his second season (2017). 85th in yards per route run in 2016 (1.03). A 2015 ACL injury derailed a promising start to his career. Left for Buffalo this offseason. 158 snaps as a rookie. Earned seven stops and five total pressures. The Los Angeles Chargers have done a great job of late, behind general manager Tom Telesco, at hiding their intentions for players before the draft. Los Angeles has historically put a heavy emphasis on players with starting experience in college and those who fit into their scheme on offense and defense. The burning question for the Chargers will be if they attempt to select an heir-apparent to QB Philip Rivers‘ throne, as the 37-year-old signal-caller’s time in the league may be winding down. 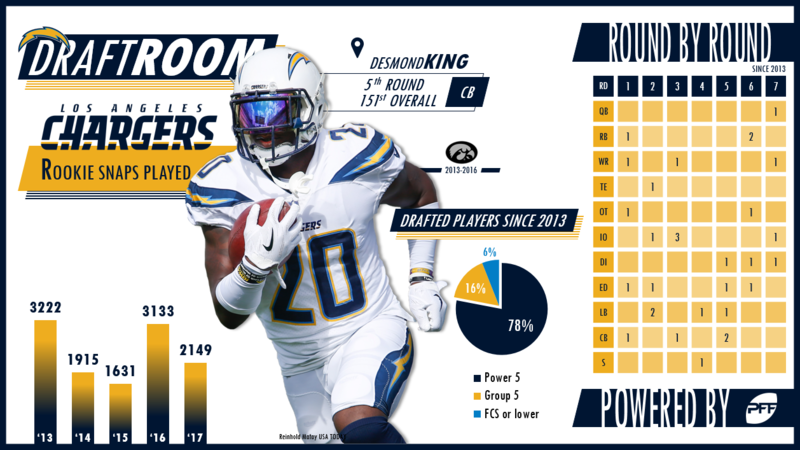 A middle-of-the-pack team a year ago, the Chargers were kept in games because of a strong defense – and the Chargers front office could go a long way at sustaining success by fixing problems that arose on the offensive line (a unit that ranked 25th in pass-blocking and 27th in run-blocking). Using our Wins Above Replacement (WAR – roughly the number of wins a team gets from replacing an off-the-street player with the player of interest) metric as a model, here’s how the Chargers’ draft classes stacked up league wide from 2013-2017. Excelled at a valuable position as a rookie, generating four sacks, 36 stops, an interception and three pass breakups. Has been brilliant when not injured. Was third among receivers in yards per route run in 2017 (2.55). Was second among tight ends in yards per route run (2.05) in 2017. Was sixth in pass-rush productivity among 4-3 defensive ends in 2017, and 14th in run-stop percentage. Struggled with injuries in his rookie year, catching just 11 of 23 targets for 8.6 yards per catch. Earned a 48.5 PFF grade as a rookie. Struggled in coverage in 2016, allowing 73.7 percent completion into his coverage during that season. Gave up 15 total pressures in just 104 pass-blocking snaps in 2015. Struggled in four seasons in then-San Diego. Bottomed out with a 34.2 PFF grade in 2015. New (old) Oakland Raiders head coach Jon Gruden has already put his stamp on what players he would like to bring in under his regime as he and general manager Reggie McKenzie approach the draft. Looking at past drafts for the Raiders may not be best at looking at what they’ll do this weekend as Gruden will likely look to continue to build around his offense and scheme. There are needs across the Raiders board but they’ll arguably need to improve a receiving unit that ranked 30th a season ago in PFF grades. 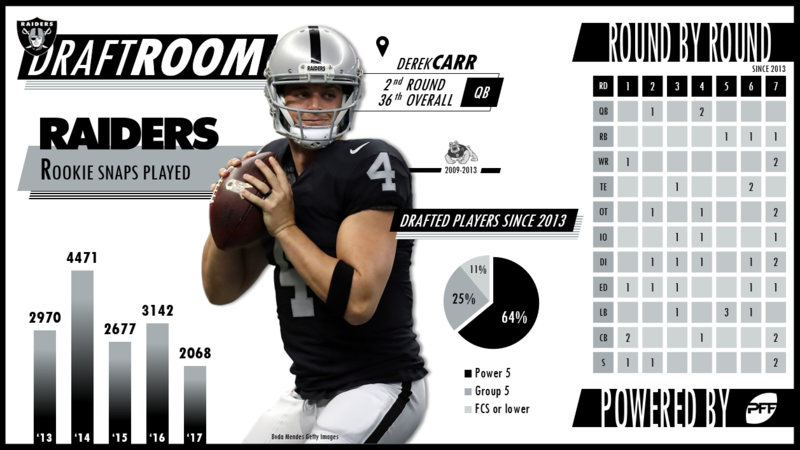 They’ve traded away WR Cordarelle Patterson and released Michael Crabtree (now with Baltimore) signaling a change in receivers is obviously coming, it’s just a matter of who else will be on the receiving ends of QB Derek Carr‘s passes this season opposite Amari Cooper and newly-signed Jordy Nelson. Their recent success in drafting solid, sustainable play along the defensive front could go a long way in this team’s success in 2018 and beyond. Using our Wins Above Replacement (WAR – roughly the number of wins a team gets from replacing an off-the-street player with the player of interest) metric as a model, here’s how the Raiders’ draft classes stacked up league wide from 2013-2017. Regressed a bit in 2017 (77.7 PFF grade) after two good seasons in 2015 (87.0) and 2016 (87.3). One of the best edge defenders in the league, both as a pass-rusher (88.6 in 2017) and a run defender (92.9). Missed a lot of 2016 with an injury, but performed well in 2015 (22 stops) and 2017 (20 stops). Fell off a bit in 2017 (69.1), but has been a solid part of the Raiders’ front-five for four seasons. Has allowed a 100.0 passer rating into his coverage on 309 total pass attempts. Has just 31 total pressures and 15 stops in 762 career snaps. Struggled in both the run game and the passing game, where he averaged just 1.06 yards per route run. Has been a weak spot on a weak Raiders defense, earning PFF grades of 41.6 and 40.8 his two seasons in the NFL.